Powerful, flexible and efficient remote application for processing all customers related transactions as well as Stock management. Developed using android technology with unlimited options on hardware implementations such as tablets, mobiles, scanners, printers. Online or offline operation with simplified ERP synchronization upon network availability. Priceless client account information for collections purpose. Detailed item data presentation including static information as well as availability and pricing. Clients visit root classification with additional notes and reasons for visit failure. E-mail communication with the clients. 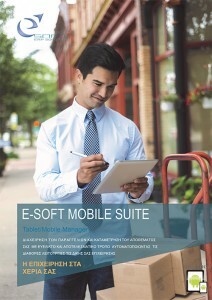 Updates e-soft ERP with all necessary date for further detailed reporting on salesperson, clients, dates, routes etc. Predefined orders and templates for faster and friendlier processing. Secured and controlled data availability as per salesperson permissions. Fast and reliable stock takes using barcode scanners. Automatic update of E-soft ERP with all documents processed through tablets ( Sales orders – Invoices – Credit notes – receipts and stock takes).